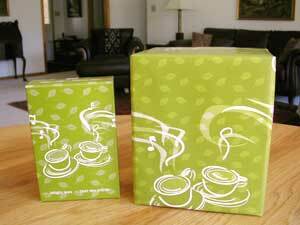 Like Julie, I have to shout out thanks to Deneen for clueing us in to Adagio Teas’ rewards. I have their simpliciTEA pot as well as the black teas sampler, but somehow I’d overlooked the rewards link. I think they’re a fantastic company, so I’m happy to link to them; it’s something I would have eventually gotten around to anyway. As soon as I cut open the box, the delicious strawberry aroma started wafting around, which I was thrilled about because I knew it meant I had received the ingenuiTEA set. Their thank-you e-mail to me said they were sending the pot, but I hadn’t expected to get the tea samples as well! After a quick taste test, I like the mango even better than the strawberry. I haven’t yet tried the cream or oriental spice, but I will soon. I’ll be sure to let you know how I like the ingenuiTEA pot after I’ve used it more. How fabulous! Yay! I just signed up as well, what a great company! 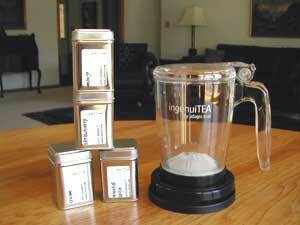 I feel like such a tea whore now, but I do love their tea and the little Ingenuintea pot is very cool!! I have a coffee/tea pot just like that! I didn’t get it from adagio teas, but I must say it’s super cool and very convenient. I will definitely have to put their tea on my list of things to try.